Fig. 1 Sarasota-Times, May 23, 1918. On May 18, 1917, Congress passed the Selective Service Act. This authorized President Wilson to draft soldiers into the United States Army in direct response to the United States’ declaration of war on Germany. To register draftees, the government held three national registration days. The first was on June 5, 1917 for all men between the ages of 21 and 31.1 The second was a year later for those who turned 21 after the first day (Fig. 1). Fig. 2 Horace W. Mink’s Service Card. Fig. 3 Sarasota-Times September 20, 1917. The U.S. Census estimated Florida’s population in 1917 as 925,641. The population of Manatee County, which then included Sarasota, was approximately 16,878.6 The population of the city of Sarasota, only a small part of Manatee county, was much less. There is no readily available age breakdown for these numbers. Based on the Sarasota-Times alone, however, the county was understandably quite proud of its number of draftees. As shown in Fig. 3, on September 20, 1917, the paper reprinted an article from the St. Lucie County Tribune (St. Lucie sits about three hours from Sarasota on the state’s east coast). The selection emphasizes the pride Sarasota felt for its soldiers, as well as its desire for peace. Fig. 1. 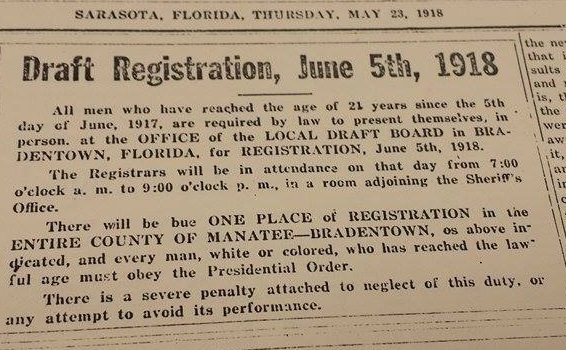 “Draft Registration, June 5, 1918,” Sarasota-Times, May 23, 1918, courtesy of Sarasota County Historical Resources, Sarasota, Florida. Fig. 2. 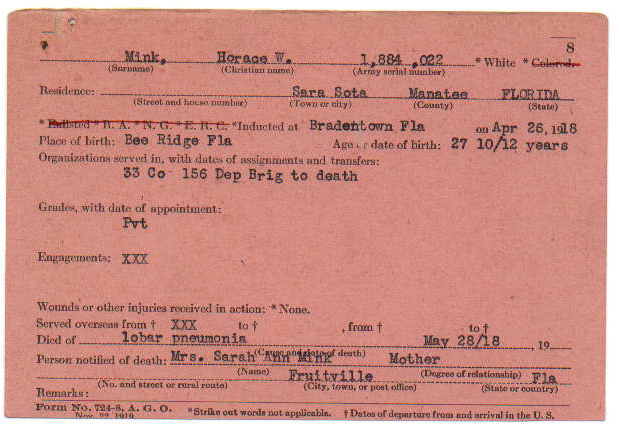 “Horace W Mink WWI Service Card,” April 26, 1918, reproduced with permission from the State Archives of Florida, Florida Memory Project, WWI Service Cards Collection, https://www.floridamemory.com/items/show/193289 (accessed March 13, 2015). Fig. 3. 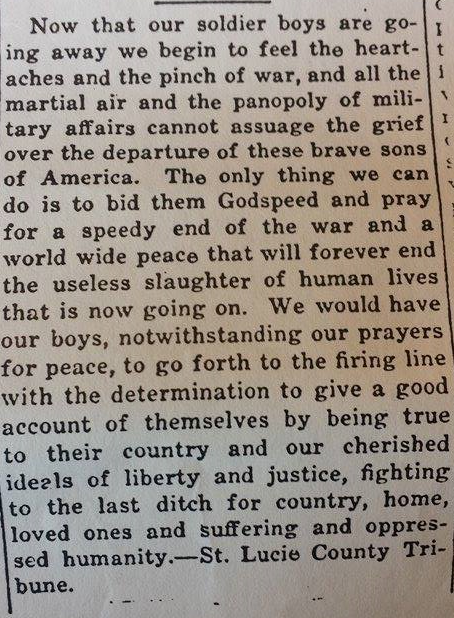 “Called to Service of Country,” Sarasota-Times, September 20, 1917, courtesy of Sarasota County Historical Resources, Sarasota, Florida. David M. Kennedy, Over Here: The First World War and American Society (Oxford: Oxford University Press, 2004), 150. “The Youth of This Nation Respond Nobly to First Military Census That Has Ever Been Taken,” Sarasota-Times, June 7, 1917. “World War I Service Cards,” State Archives of Florida, https://www.floridamemory.com/collections/wwi (accessed March 13, 2015). “Estimates of Population, 1917,” United States Census Bureau, http://www2.census.gov/prod2/decennial/documents/13346688ch1.pdf (accessed March 11, 2015).